Cheahjx: this is a very good trading group.. They helped me to understand the reality of trading and opening my views and perspective of the world . they also honestly helped and adviced me regarding trading as I am still learning and that is actually what we need as a learner. I would like to see their podcast again some day as it really is knowledgeable and full of insights . The Trader Station team provide high quality trading set ups for both experienced and inexperienced retail traders. On the face of it, participants may be surprised at the lack of indicated set ups or 'signals', however after time you begin to realize that this conservative approach to trading is what makes Trader Station so unique, Rather than a traditional signal or education company who is known to push signals day in day out, the analysts at Trader Station only post when they have an iron - clad set up. It is rare to come across a group who can provide a consistent offering of risk managed trade set ups, whilst also offering trading education for those who want to pursue it. They are in no way pushy of their offering's and all 'signals' are completely free. TTS, the most honest and transparent trading relared group. 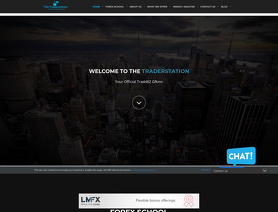 The Trader station are a fantastic group that provides free support and insights that help with general life and the trading life. One of the best things of TTS is the transparency of their signals and content. There are not many groups out there that tell you the honest journey of becoming a trader, rather than promoting flashy cars.. they promote hard work ethic and investment in yourself.